Articles Tagged "Solar Cycle 25"
.....There has been quite a bit of news about a predicted grand minima in solar activity. We recently reported on a conference where three lines of evidence were presented, seeming to point to a future disappearance of sunspots, perhaps like the dreaded Maunder Minimum. I am not unbiased in this regard, and like most radio amateurs, yearn for high solar activity. Alas, a return of Solar Cycle 19, the granddaddy of them all, seems elusive. But there is some dissent regarding these predictions of no sunspots, which gives us hope. On Wednesday, I spoke with Dr. Douglas Biesecker, an astrophysicist at the NOAA Space Environment Center in Boulder. He was mentioned in the Solar Update for June 17, dissenting from the assertion that evidence points toward sunspots disappearing or another Maunder Minimum in our future. He mentioned something called a Gleissberg Cycle. When we do a really long smoothing of sunspot numbers, the smoothed sunspot numbers we are familiar with -- the data used in those nice graphs of sunspot cycles -- average data over 13 months. So every place you look on the graph doesn’t show the variation that occurred during that month, but instead averages data over more than a year, to smooth out all the noise of daily variations. But what would happen if you smoothed the numbers over a much longer period, say 11 years? Could you find some periodicity that would suggest a cycle of cycles or perhaps predict clusters of decades with low or high solar activity? Gleissberg cycles suggest a periodicity of about 87 years, and some have studied these to try to predict general levels of solar activity over multiple decades. But if a cycle is 87 years long -- and we only have about 256 years of directly observed solar data -- the most we could look at would be less than three cycles. That isn’t enough data to make even crude speculative projections. Sun’s coming quietude burns global warmists. Reports of imminent climatic catastrophes are turning out to be rather anticlimactic. That’s because rather than heating up to life-threatening levels, new scientific findings indicate it’s more likely the Earth will cool in coming years. That’s bad news for a global-warming industry heavily invested in a sultry forecast. Cornelis de Jager, a solar physicist from the Netherlands and former secretary-general of the International Astronomical Union, announced that the sun is about to enter a period of extremely low sunspot activity, which historically is associated with cooling trends. Backed by other scientists, he predicted the “grand solar minimum” is expected to begin around 2020 and last until 2100. 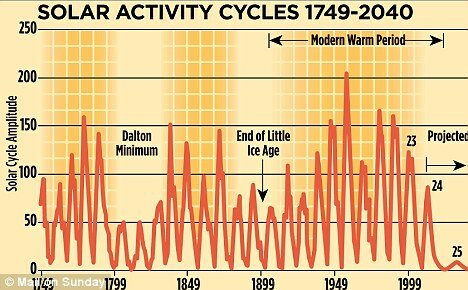 The ebb of solar activity is shaping up to resemble what occurred during the Little Ice Age, the period from 1620 to 1720 when sunspot activity diminished and temperatures dropped an estimated 3 degrees Celsius. The era was noted for colder-than-usual winters in North America and Europe, when rivers and canals froze over, allowing for ice-skating and winter festivals. It also resulted in crop failure and population displacement in northern regions such as Iceland. To characterize the impending grand solar minimum as an “ice age” - with glaciers forming at temperate latitudes - would be an exaggeration. The correlation between decreased sunspot activity and falling temperatures means it’s likely to get colder when the sunspots begin to disappear.